Rootsweb Board for Hastings Co.
Carlow Twp. in historical HASTINGS Co. Opened in 1866 and named after an Irish town. One of the northern townships in the Archaean rock region. HINT: Before fine-searching the online maps, verify from the database of transcribed names (bottom). Early survey maps with names of original patentees – over-written with subsequent owners. 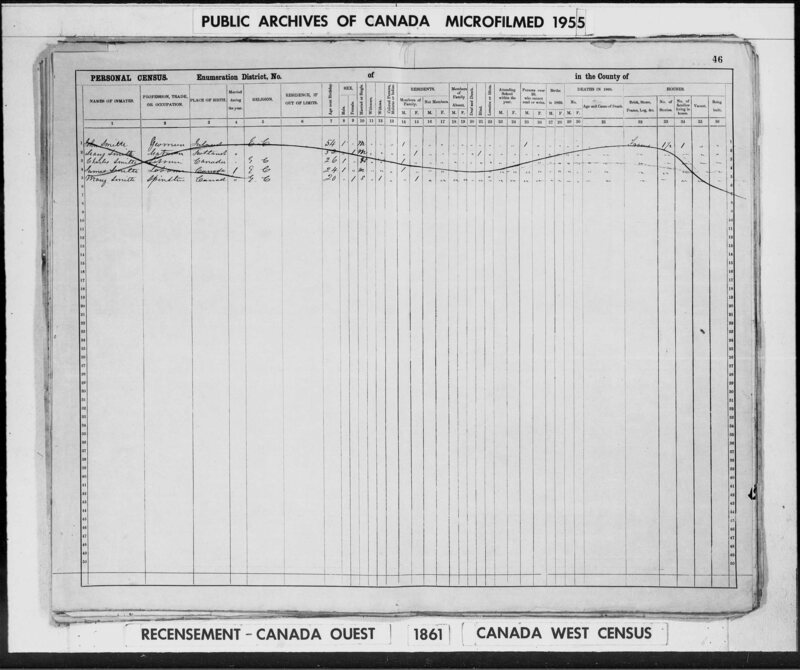 See the Archives of Ontario Summary and Index to Early Patent Maps, or Search by Township. The names on these maps are not transcribed, nor will they be included in our project. However, our databases do include transcriptions of names from early Grant/Patent RECORDS (those issued prior to 1826). No pre-Confederation era maps have been found, or are known to have been published. See the hand-drawn Patent Maps. This Township is not included in the 1878 HASTINGS & PRINCE EDWARD, by H. Belden. Maps at McGill University's Digital Atlas Project cover the Post-Confederation period (late for the scope of this project). Names of land-owners are transcribed at McGill's site. 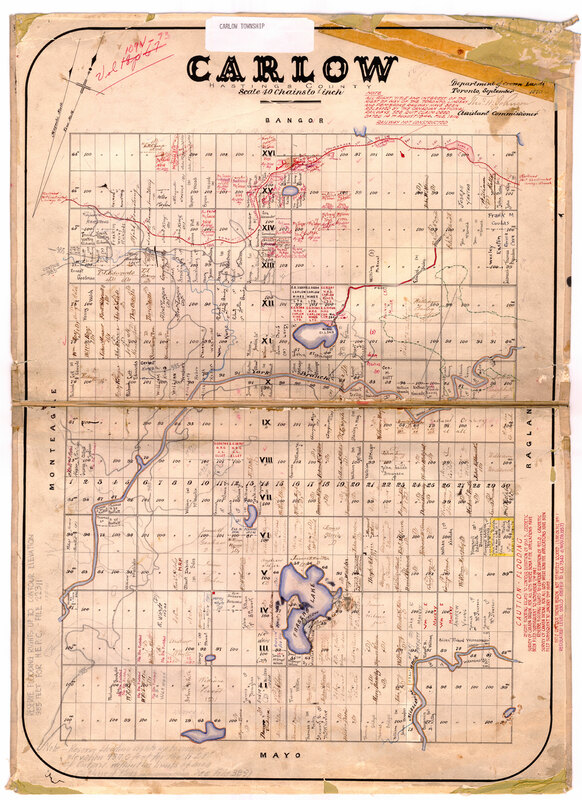 Ontario’s Ministry of Natural Resources has placed online “Historical” (undated) Mining Claim Maps. They may be helpful for locating Concessions and Lots in northern townships. http://www.geologyontario.mndm.gov.on.ca/mines/lands/historic_claims/pdf/C/Carlow.pdf” target=”_blank”>M.N.R. Map for Carlow Twp. HINT: Before fine-searching the online directories, verify from the database of transcribed names (bottom). Find Concession/Lot Locations from the Agricultural Schedules of the Canadian national Censuses. 1842 (limited), 1851, 1861 and 1871. Ag schedules and nominal schedules were enumerated within a group of northern townships, but not specifically identified, among the following: McClure, Herschel, Faraday, Wollaston, Wicklow, Monteagle, Dungannon, Limerick, Bangor, Carlow, Mayo and Cashel. * The LAC search form is pre-set to search this District, and for Agricultural schedules only. However, these indexes are significantly incomplete. ALL IMAGES ARE AVAILABLE by page number, in the chart, above. Contact me with questions, linking errors, etc. Important: See FINDING AID – involves a few steps. * The Enumeration Division must match the corresponding Sched. 1 Personal Census. Header titles on each census page aren't always fully descriptive of the Districts and Divisions. Rely on indexed information at Ancestry or FamilySearch. 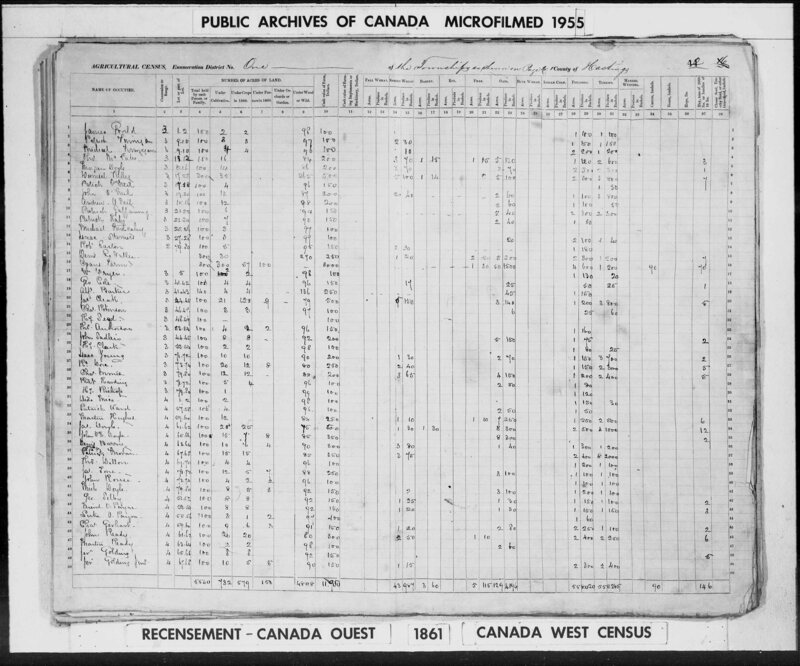 HeritagePIN's own updated list of Named Villages and Settlements in Ontario, based on the 1857 Canada Directory (Lovell) and the 1869 Province of Ontario Gazetteer and Directory (McEvoy/Clark), and on descriptions found in 30+ Pre-Confederation Directories. See also notes about Administrative Districts that crossed established boundaries. Many more details and maps are found in the pages for each Township (follow links). HeritagePIN has a number of Name Transcription Projects on the go since 2008. The time period of study is Pre-Confederation (1867). 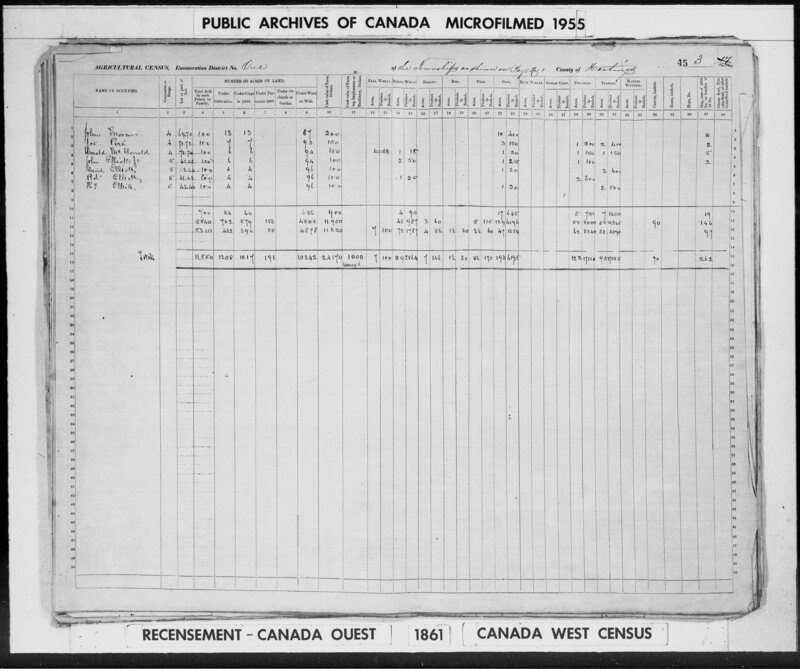 Since Ontario's civil records program took some years to fully implement, this time period has been extended to include Ontario's documented inhabitants prior to the mid-1870's. I had been able to photograph several of the (brittle) Pre-Confederation maps at various universities and archives, and by 2016 the University of Toronto has made images available ONLINE for many more! The names in these databases have been transcribed by me personally, and include names from the inset town maps, and indexes of subscribers, located in the margins of each map. Likewise, with historical directories, names have been transcribed by eye, not by OCR (conversion to text). They include those entries for individuals living in towns and cities. Where maps and directories are sparse for a township, or for an early time period, the Databases are supplemented with record-sets * that show names and Concession/Lot locations *. 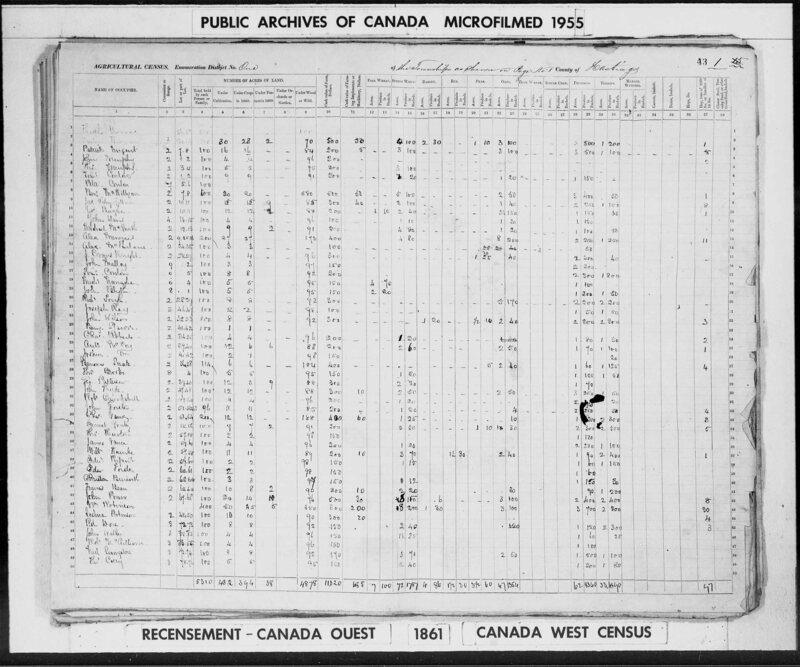 These include early Land Grant/Patents, and Agricultural Census returns.